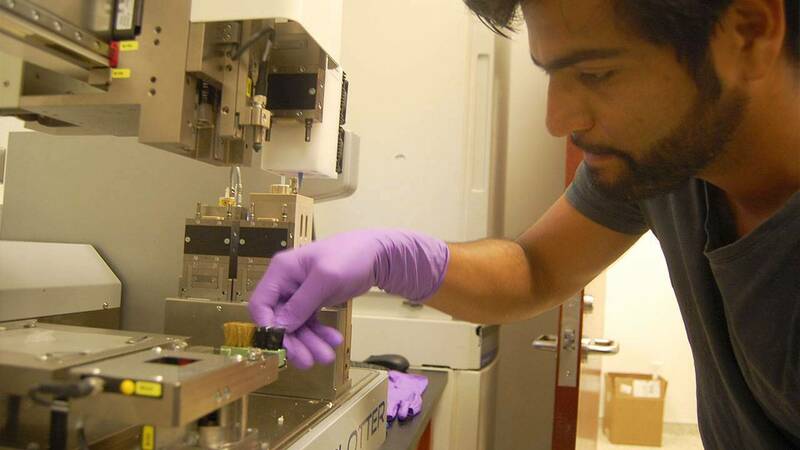 The Biomedical Engineering Doctoral program at The University of Texas in San Antonio is exploring the challenging space of organ transplant by using a 3D bio printer capable of printing living cells into a gel-like 3D organ part. The concept is a leading example of the intensive research and innovation that stems from Dr. Teja Guda, assistant professor of biomedical engineering and his team of graduate students. In this episode, SciTech Now learns how this rare device is being used as a fundamental building block for the future of transplantation. What's unique about the Envision-TEC 3D-Bioplotter System being used is, unlike other 3D printers, this particular one uses neither high pressure nor high temperature when printing. This essentially promises tissue compatibility and survival, while developing a way to maintain its shape. For now, the team has successfully printed a jaw organ using silicon material. Though, no living cells have been used, that will change soon, using lab mice as the cell sources. The objective is to practice organ transplants to find if the replicated organs work just as well as the original. Once UTSA comes up with unique materials, they can potentially sell these materials to clinics, doctors, and military across nations. “Doctors would buy these materials, add the patient’s cells, and be able to print custom tissue parts in a regenerative medicine center or a hospital in the future”, states Dr. Guda. The team hopes this advancement in biomedical engineering can change the world of transplantation in the next 10 years. Finding a donor match today is a long, grueling process, but Dr. Guda and his team are very close to finding a less strenuous way to acquire a missing or damaged human organ, possibly saving more lives in less time. Watch this pioneering episode of SciTech Now on Friday, July 22 at 7:30 p.m. on KLRN.